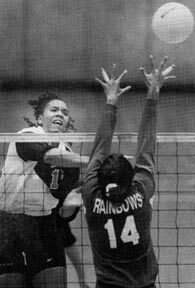 Cathey Scotlan, played volleyball at Holy Names High School in Oakland and received a full scholarship to play for the University of the Pacific in Stockton from 1987-1990. At UOP Cathey was an All-American and led the team to the NCAA Championships. 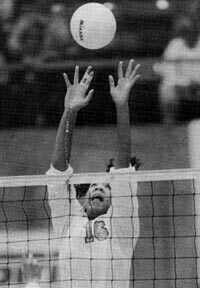 She went on to play volleyball professionally in Switzerland, where in April 1993, she was stricken with encephalitis. Since that time, Cathey remained in a coma until her passing on April 13, 2012. However, the records she attained while at UOP are still standing. In 2000, Cathey along with her teammates were inducted into the UOP Athletics Hall Of Fame and in April 2006 Cathey was inducted as an individual UOP Athletics Hall Of Fame. Cathey Scotlan is an inspiring young African American woman, whose courage and commitment to the game serves as a model for our young Starlings. We honor Cathey by displaying her number (#16) on our team bags. Cathey's family members are strong supporters of Starlings Volleyball Program and Laura Scotlan (Cathey's sister) serves on our Board of Directors. ALL PHOTOS PROPERTY OF UOP.